Born in Kamloops, BC Aug 12, 1940. Passed away peacefully in the early hours of Jan 23, 2019. Growing up she lived in many different mining towns throughout BC and Saskatchewan, living her later years in Hope, Chilliwack and finally returning to Kamloops in 2016. Barb is survived by her daughter Susan Glennie of Kamloops, daughter Dawn (Ron) Woodland of Kamloops, son Brian (Rhonda) Glennie of Chilliwack and daughter Donna Wiebe (Barry) of Calgary, AB, as well as seven grandchildren and six great-grandchildren. Also survived by her sister Cheryl (Garry) Klassen of Chilliwack, sister Wendy Flodstrom of Chilliwack and brother Don (Pat) Flodstrom of Kamloops, along with numerous nieces, nephews, cousins and aunts and uncles. Pre-deceased by her parents Sigurd (1984) and Eileen (2003). 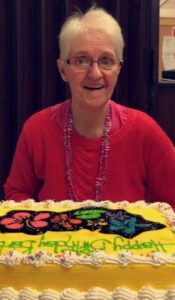 Barb worked at many different jobs throughout her life but was most proud of her last job as Cake Decorator at Dairy Queen in Chilliwack. She loved spending time with family and friends and was especially proud of all her grandchildren. They were the sparkle in her eyes. Barb enjoyed going to the casino and loved the bus trips across the border with Auntie Gwen always hoping for the Jackpot!! Her hobbies included sewing, knitting, crocheting and reading. Barb’s drink of choice was white rum and coke, please have one in her honor with a smile on your face. The last two years of her life were spent at Pinegrove Care Home in Kamloops, where she kept the staff on their toes always helping out with ‘reorganizing’ their paperwork. Barbie was an amazing mom, grandma, sister, aunt and friend. She will be missed by all who knew her. The family would like to thank the doctors and nurses on 5 south of Royal Inland Hospital, but most of all the wonderful staff at Pinegrove Care Home who made Barbie feel at home from the day she moved in until her final day. We will be forever grateful. A celebration of Barbie’s life will be held in Kamloops in the spring of 2019, date to be determined. In lieu of flowers please donate to Pinegrove Care Home, Parkinson’s Society of BC or the Alzheimer’s Association in Barbie’s memory. Sorry to hear of the passing of Barb, you and all your families are in my thoughts at this time. Please treasure all your memories of Barb as a Mother, Sister and Grandmother. Being with family was of the utmost importance to Barb and I know she will be greatly missed by all of you. To the Glennie family. So very sorry to hear about the loss of your mum. She was a lovely lady. Our thoughts are with you during this difficult time.